bosley: I really hate to do it, but have been informed that the company that owns the camera is no longer maintaining it. Sorry folks. 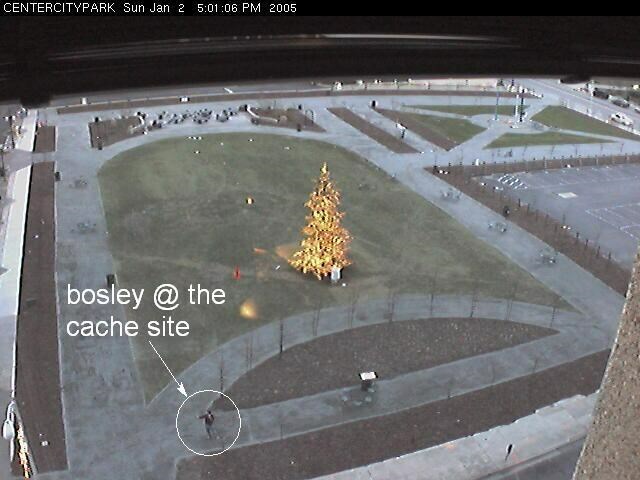 This Webcam cache is located in downtown Greensboro, NC. A link to the City Center park location and information can be found HERE. Please note that if you plan to do this one at night the camera refresh rate is reduced to once per hour after about 9pm. The group maintaining the webcam is CAROLINANET.COM. Note: The picture above is no longer accurate, there is a significant amount of construction in the area and the main park area is fenced in. The coordinates should take you just outside the fence. This is on a street NOT a sidewalk... So if you attempt this, PLEASE be careful!! The cache location is near the intersection of Elm St. and Friendly Ave. The resolution on the camera is not good enough to make out facial detail. So, in order to log this cache please have your web-buddy capture a picture of you at the coordiates with your right arm outstreched and GPS in hand There is no "capture" mode with this camera so to get the image on your computer right click on the image and select "copy image" and then paste into your favorite graphics program. Please post the photo with your log. The webcam page can be found HERE. centercity2.JPGCenter City Cache site in downtown Greensboro.